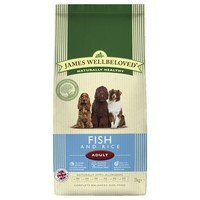 James Wellbeloved Adult Dog Fish and Rice is a complete, hypo-allergenic food that contains wholesome, natural ingredients that an adult dog needs to keep fit and healthy, without including any artificial colours, flavours or preservatives. Perfect for dogs with skin irritations and loose bowels, the food uses activity balanced proteins to calm hyperactive behaviour and contains seaweed, alfalfa and yucca in addition to natural sources of vitamins E and C for their anti oxidant qualities. James Wellbeloved is great for dogs when they have finished the growing stage of their life and will take them through to their senior years.